Most startups begin on a tight budget. Who knows better than a marketing advisor for startups? To help you kick off with your sensational new project, here are 10 completely free marketing strategies for startups for you. Test them out – and let me know about your favorites and your results in the comments below. Note: Please understand that nothing is ever completely free. While below tactics are all free of charge, they do come at a cost: Your time. To not waste your time, below free marketing hacks are sorted from most efficient to least efficient. Start with the first one, then work your way to the bottom. Bear in mind that efficiency can vary from industry to industry. If you disagree with the sorting, justify your opinion in the comments below. And to save you even more time: Remember you can always outsource tasks. Or book a marketing consultation to determine and implement the best free marketing strategies for your startup together. Note: All mentioned free marketing strategies for startups build up on the assumption that you do have a live website already. In case you don’t, learn how to create a website in 2 simple steps. If you plan to run a marketing strategy without website, get in touch and we can develop the smartest marketing plan for you together. The currently most profitable marketing tool are emails. The beauty is: Email marketing can be excellently automated. Creating a workflow with several emails takes one afternoon, and these are then sent out whenever someone signs up for your newsletter / clicks a specific link or button / has birthday / whichever trigger you choose, without you having to lift a finger. It’s as close to magic as marketing gets! And yes, some good newsletter systems won’t cost you a dime to start with. Simply check out the 3 best free newsletter programs for startups. Select one, sign up, and get going. The sooner you start, the better. Certainly the best free marketing strategy for startups. If you do incubate incredible ideas, produce superb products or sell sensational services, feel free to reach out to online influencers. These can be bloggers, vloggers, Facebook freaks or any other person with an acceptably-sized audience. Internet stars always are in need of fresh and exciting content for their followers. When starting out, target the smaller influencers first – they are a lot easier to get through to. And: Remember to follow up! Don’t stop after the first email, but send a second and a third. If you haven’t heard back at all after the third email, stop emailing and move on to other potential supporters. You don’t want to annoy anybody. But never stop after one single email only – that gets overlooked way too easily. If you become good at this, you won’t need much more marketing. Just remember to have your email system in place to collect website visitor’s contact details. 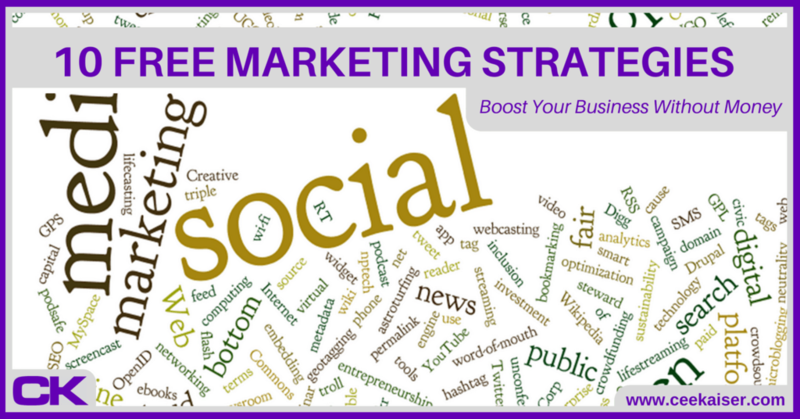 Yes, Social Media can be a highly efficient marketing tool. However, it can also waste you massive loads of time. Be careful, and very selective. To start with, choose one single platform to focus on. You cannot tan at every beach. If you do decide to walk the walk, do it properly. Join interest groups, help others, comment on comments and answer your messages. Nobody said this will be easy. Offline influencers are any kind of ‘traditional’ media, such as newspapers, magazines, radio stations etc. It never hurts to reach out to them, one never knows when you’ll reach the right person at the right time. To maximize your chance of being heard: Follow up. Btw: I hope I don’t have to tell you to please do at least a very little bit of due diligence before reaching out to anybody. Mass mails certainly won’t cut it, and contacting an animal-focused magazine with your brand-new idea for a dentist’s tool might not be uber efficient either. Give it at least a little thought before you give it a shot. Another excellent free marketing strategy for startups is using your competitors. Research your competitors, and comment on their blogs and social media posts. Your target audience is already there, few better places to gain their attention. Especially efficient: Offer the complete contrary viewpoint to your competitor on selected topics. The resulting discussion is the best marketing you can wish for. I know this does sound super old school, but: Talk to people in real life! No matter when and where you meet them: Tell them about your project. In case you need an ice-breaker: Create a 3-question survey on your project, and kindly ask people to offer you 20 seconds of their time. Especially while waiting for the coffee to brew or using public transport few people will reject. Advanced real-life marketers always carry business cards with them, to ensure that after a friendly chat people visit their website / sign up for their newsletter as well. A slightly advanced approach to market yourself might even yield some profits for you. Speak at conferences and startup conventions or organize community gatherings. You do need a lot of expertise in your field for that, and quite some balls, but the effect is tremendous. Not just do many speakers receive a remuneration for their efforts, but you can perfectly market your product / idea / service at the same time. As long as it solves a problem for your audience, that is. And I’m confident you will select your audience accordingly. Guest blogging is the fine art of publishing a text anywhere on the web which makes every reader so incredibly hungry for more that they cannot resist but visit your website immediately. To fuel things up, you can of course also include some subtle links in your guest post, leading straight back to your page. Most suitable for guest blogging are blogs and websites with an existing audience, the bigger and the more geared towards your own project, the better. A popular place to start is often medium.com, but generally any site in your or a similar industry will do. Same as with reaching out to online influencers: Smaller blogs are often easier to convince. Whether they are worth your time, though, is up to you to judge. No matter which industry you are in, there are dozens of online communities for it. Join them, discuss with them, answer questions, help them. And, whenever suitable, post a link back to your website. Note: Make sure to not be spammy. When I first tried this technique, I got irreversibly banned from the community within the first hour. Don’t be fooled: Doing this right does cost quite some time and a lot of actual expertise. Yes, yellow pages still exist. So do phone books, city services directories and the likes. List yourself as the expert in your field. Usually listings are free. It might not be the most efficient free marketing strategy for your startup, but it has already created business for some. The good news: Once listed, you’re in. But you may still want to update the listing once a year or so. In case you are location independent, list yourself nonetheless. In that case you even have the opportunity to list yourself in various directories. Often a local phone number is sufficient, and that can easily be obtained via Skype.